Detail on door headers when a hoist track is passing from one room to another. 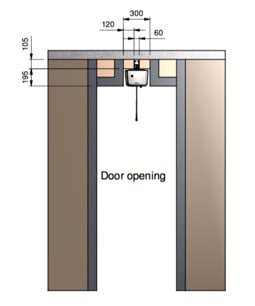 The optimum solution is to have the track form part of the door header. This ensures there is no noise or light pollution from one room into another. Normally this is applied to an ensuite bathroom door. This normally requires special height doors to be manufactured to the appropriate height. Often demi-doors are installed. Normally the track is mounted close to the finished ceiling, and therefore taller than normal doors are required. 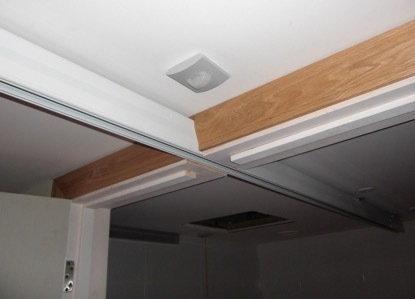 The dimension for mono-rails (providing using our 90mm track) is 100mm from the finished ceiling to the bottom of the door header. From this the size of the door can be calculated. The size of the H system will dictate the depth of the H system moving rail (either 90mm, 140mm or 180mm rail). For the door height and position of the door header this then effects the depth from the finished ceiling to the bottom of the door header. 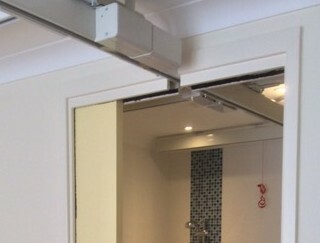 For 140mm or 180mm H system moving rails add 50mm or 90mm onto this dimension (so finished ceiling to bottom of door header is either 250mm or 290mm). 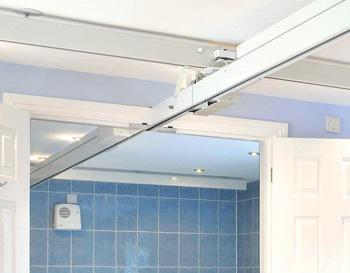 If a pocket or sliding door is specified, we recommend discussing with your Product Specialist about a specialist manufactured Pocket Doors for use with Ceiling Hoists (see http://www.eclisse.co.uk/Disability-And-Eclisse/Hoist-System). The alternative is a gap in the track and a specially modified OT200 Ceiling Hoist. Please enquire with your Product Specialist. 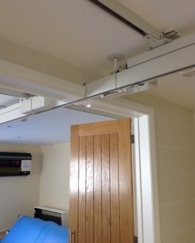 If a door is already in place and budgets do not allow the above, a rectangle could be formed above the door to allow the ceiling mounted track and motor to pass through. Although this can be less aesthetically pleasing and allows light and noise pollution it is often the most cost effective solution. The gap required is 300mm centred for the hoist to pass through. 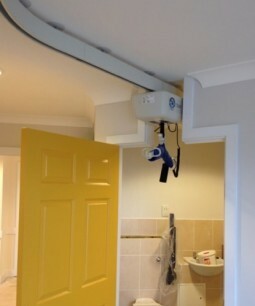 At OpeMed we offer full design advice for your Ceiling Hoist Projects. If you have an upcoming project you would like to discuss with us in more detail, please contact us and request a FREE consultation with our Product Specialists.